Trinity College Dublin Student’s Union council have passed the motion to oppose student loans, two years on from the initial rejection of the motion. The motion that was formally passed, supports the Government funding the higher education system instead of introducing a loan scheme dependent on student’s future incomes. 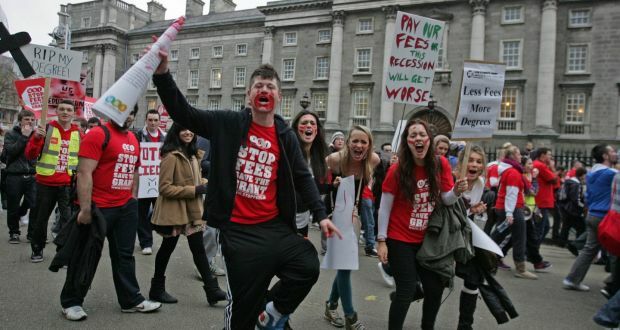 TCD SU has been opposed to the government increasing fees since a vote was passed by the council in December 2015, but they did not oppose a government-supported student loans scheme due to the motion being defeated in November 2015. The motion passed on January 24th, 2017 was brought forward by “Students Against Fees”, a group of students in TCD who campaign for the abolition of fees and the introduction of loan schemes. Science Convenor of TCD SU and member of Students Against Fees, Conor Reddy, said that the council needed to “formalise a position within the union against fees and loans of all kind”. The introduction of an income-thresholds loan system. Students turned out in their thousands on October 19th 2016 to protest against the introduction of the third proposed option, an income based loan system to fund higher level education. Student bodies from Sligo, Limerick, Galway, Carlow, Cork and Dublin were represented in the demonstration organised by the Union of Students in Ireland (USI). If approved by the government, this option would force students to pay over €20,000 once they reach a certain income threshold after graduation. Speaking to the council on the passing of the TCD’s newest motion was TCD SU’s President Kieran McNulty, who pointed out the failure of the loan system in other countries including Britain where £40 out of every £100 is not pair back to the government. “Loan systems in Britain and Australia have major problem and pitfalls, and it’s naive to think we could do loans better than the UK, or do it better than Australia”.